I’m not talking about correcting real typos and Sanskrit errors. Should we make significant changes which alter the meaning of text in books which have already been edited by editors chosen by Srila Prabhupada and completely approved of and personally used by Srila Prabhupada on a daily basis for his personal reading and giving classes from? Should such changes be made secretly by the BBT without informing the devotees that the books have even been changed, and perhaps without even informing the GBC and other leaders in ISKCON? Should such changes be made completely at the discretion of the BBT editors without any requirement they justify the changes they have made, or even document them? Many devotees are completely against changing even a word of the original published books of Srila Prabhupada, and that is fine by me and most other devotees also. I’m quite happy with all of Srila Prabhupada’s books as they were originally published and personally approved of by Srila Prabhupada. I have read all of Srila Prabhupada’s original books many times and the effect they have had on my consciousness is very nice. They are certainly very potent as Srila Prabhupada approved of them. If we continue to distribute Srila Prabhupada’s books as he personally approved of them they will continue to make new devotees and thus the Krishna consciousness movement will automatically expand. There is no doubt about that at all. Many devotees, however, in principle, are not opposed to correcting real typographical and Sanskrit errors in the original books. The thing which concerns me and most other devotees is not the actual correction of real typographical errors in the English and Sanskrit in the original printed books, but the “revision and enlargement” of the books. >Prabhupada staunchly opposed needless changes. There are so many substantial changes. It is no longer the same book as the one Srila Prabhupada personally approved of and used himself at all. Jayadvaita Swami himself calls it the “Revised and Enlarged” edition. Of course we have written to Jayadvaita Swami and asked for his explanation, as you know, many devotees have done that over the years, but he always replies with the same letters [one to Amogha Lila and the other to "Senior ISKCON Devotees"] he wrote in 1986, which quite convincingly demonstrate there are a number of bona fide typos and Sanskrit errors in the original Bhagavad-gita which he has corrected, however there is no hint that he has made many changes and revisions which alter the meaning of the text in the book from the original approved by Srila Prabhupada. In many places he has, perhaps unintentionally, subtlety changed the meaning of the text thus causing it to present a COMPLETELY different meaning from the original. That is the most disturbing aspect of the changes. If he simply corrected the typos and Sanskrit without altering the meaning of the text and without trying to remove Hayagriva Prabhu’s editing who would have complained? After all Srila Prabhupada selected Hayagriva to edit the book and liked his editing. So it is not difficult to see here that the editing has COMPLETELY changed the meaning and the original point has been COMPLETY lost. The original, approved by Srila Prabhupada, says void philosophy causes frustration whereas Jayadvaita’s says void philosophy “arises from frustration”. If this was an isolated incident that would be one thing, but there are hundreds of instances like this were the new version subtly imparts a completely different meaning to the original approved by Srila Prabhupada. We have sometimes presented such things to Jayadvaita Swami, but he does not seem to be able to conceive such changes of meaning exist in the new edition. He just gets angry and calls us “self-righteous” and “abusive” and “refuses to correspond further”. On such an important issue as the authorization and validity of changes to Srila Prabhupada’s books, a point which is fundamental to the credibility and authority of the entire ISKCON movement, this is not a very satisfactory reply. It would seem to us that the BBT have given absolute authority to Jayadvaita Swami to change anything he likes at all in Srila Prabhupada’s books without anyone even checking or approving of what he does. Of course that may not be that case, however that is what appears to be happening. So it is a very dangerous position for ISKCON as, really, everything in ISKCON depends on the authority of Srila Prabhupada’s books. Srila Prabhupada’s books are the real asset of ISKCON. They are the attractive principle. this point. All the groups are declining including the Christians. If someone is making changes to Srila Prabhupada’s books, but is not prepared to justify them, and if the BBT refuse to make the source-material which authorizes such changes available, it does not look good. Prabhupada liked, regularly read from, 100% approved of and relished reading his original “Krsna Book”. Satsvarupa Maharaja’s editing is very nice. I’m sure he has not changed the meaning from Srila Prabhupada’s dictation tapes. The English is very good. There are some Sanskrit errors and typos of course. If they were corrected who would complain? But Jayadvaita has practically re-written the book! He has completely changed the editing style, removed all the words he considers redundant, in places added in what appears to be his own preaching, and he has used Hridyananda Maharaja’s translation of the Tenth Canto to “correct” Srila Prabhupada’s Krsna Book… It is a disaster and heart-breaking to me… Who authorized him to “correct” Srila Prabhupada’s “Krsna Book”? Who would be interested in any of the worlds great literary classics “corrected by Jayadvata Swami”? It is ridiculous. People want to read the original book! And “Perfect Questions, Perfect Answers”… That has been “re-edited” by Sita devi dasi… Who is “Sita devi dasi” anyhow? What gives her the right to change Srila Prabhupada’s books? She has deleted so many things from “Perfect Questions, Perfect Answers”? What is the explanation? I don’t think the BBT even told anyone they changed the book!! Did the GBC approve of these changes? We have the original transcript of the conversation and the text which has been deleted from the new edition is in the original transcript of the conversation. She has deleted Srila Prabhupada’s instruction that performing devotional service for some material benefit is business not devotion, she have deleted Bob asking Srila Prabhupada, “You mean by following these [regulative] principles,” and Srila Prabhupada replying “Yes.” She have deleted a whole discussion about miracles, “Miracles are for the ignorant”. She has deleted Srila Prabhupada saying “Our knowledge is perfect.” She has deleted Srila Prabhupada saying chanting Hare Krishna is a yogic process! Srila Prabhupada’s instruction that one who does not have perfect knowledge should not teach has been completely removed… And what to speak of Srila Prabhupada’s four page discourse on independence and the fact that we are always controlled either by maya or Krishna. It has been completely deleted from the new version along with so many other things. How can the BBT delete so much text from such a small book?? Who instructed Sita devi dasi to do this? Some of the ISKCON Matajis may be a little pacified by all these changes to Srila Prabhupada’s books… But is that really the business of the BBT? And where has this idea of changing Srila Prabhupada’s books come from in ISKCON? Why are the Matajis demanding Srila Prabhupada’s books be changed? Do they no longer have any faith in Srila Prabhupada and his books? Who has taught them this?? Surely the BBT has a far greater responsibility, the responsibility to print and distribute Srila Prabhupada’s books as he approved of them? Without changing the message in the books? Perhaps with real typos and Sanskrit errors corrected. If that is all the editors do then who would complain? is being reviewed by several papers. I have got many others books. without philosophical basis, it is simply sentiment or fanaticism. And philosophy without idea of God is simply mental speculation. How can we make Prabhupada’s books “acceptable” to people in maya? We have to make the people in maya Krishna conscious then they will not only accept, but they will relish Srila Prabhupada’s books. But if we water-down the books to make them “acceptable” to the public and the feminists then the potency will be lost and they will no longer be relishable by the devotees either. It is like sweet-rice with sand in it. It’s still sweet undoubtedly but how can you enjoy it mixed with sand? I pray that you will consider what I have written and write back, not like Jayadvaita, calling me “self-righteous and abusive”. But an honest reply. I am totally distressed to know about so many changes in Srila Prabhupada’s books.I don’t know if there is any hope for me to advance in spiritual life. I see no direction in life.I want to know how i can get Srila Prabhupada’s original books and understand them. 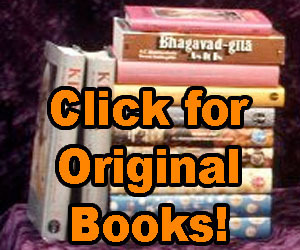 Thank you Madhudvisa Dasa prabhu.You have opened my eyes.We need to refer Srila Prabhupada’s original books to keep his movement genuine and authoratative.Where could I download original books from? There is a recording of Srila Bhakti Sundar Govinda Maharaj replying to a question asked Him as to jas asking Him any questions.